And, so it was, in 1945 Crescent Electric Supply Company officially became a family business. Jim and John, like their older brother Tom before them, had to learn about the electrical supply business. 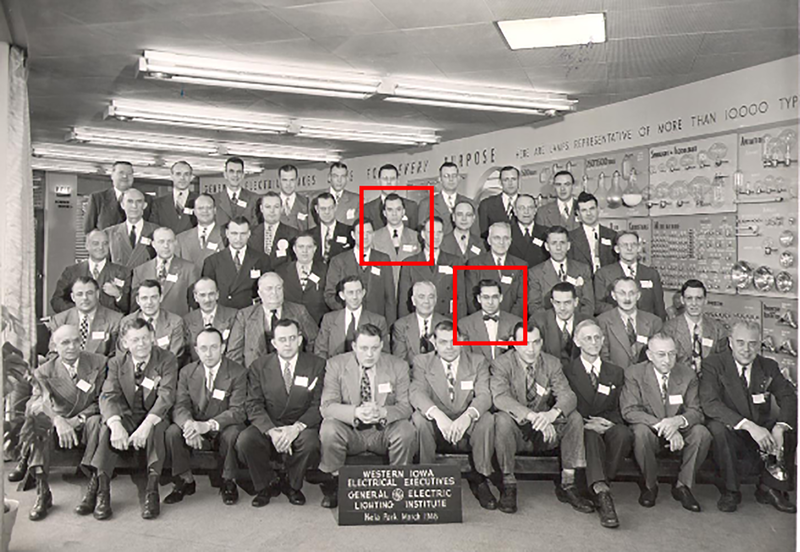 Above is a photo of Jim and John Schmid at the General Electric Lighting Institute in March, 1948. 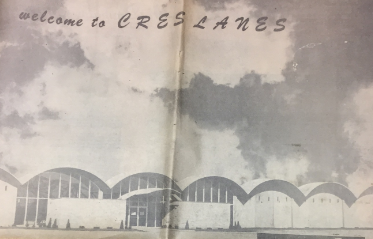 These photos are from a 1958 newspaper advertisement announcing the opening of Creslanes Bowling Alley in Dubuque, Iowa. Tom Schmid’s new business card with the title of President in 1966. Many family businesses struggle with hurt feelings and jealousies between family members. 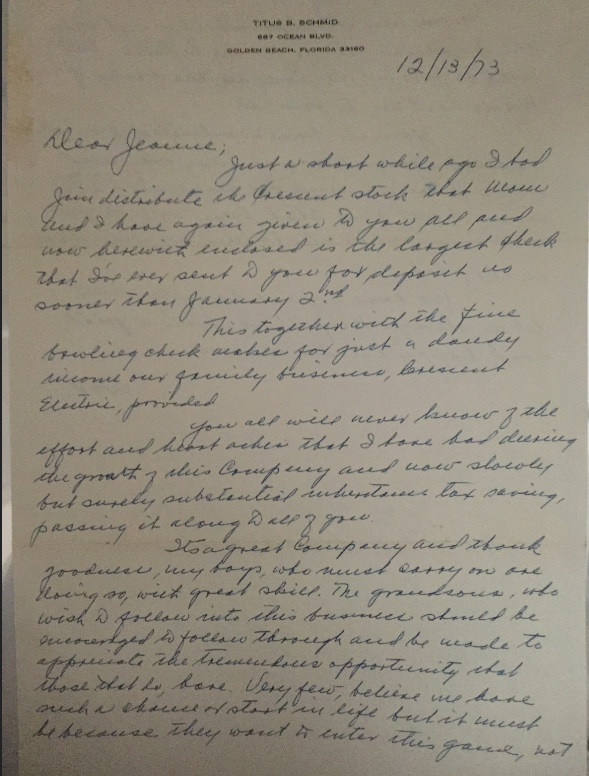 This memo, sent by Tom Schmid to his siblings, demonstrates the Schmid brothers were not immune to some of these challenges. Tom sent this memo after the company produced a new brochure, likely shortly after the article highlighting Tom as President of Crescent appeared on the cover of the trade magazine Electrical Wholesaling in 1968. Attached is a copy of the company brochure, which in general I think is very good. My picture has more prominence than I wanted and could be a sensitive point. I feel an explanation is in order. The advertising agency, rightly, felt Dad’s picture should be in it as part of our history. They felt the current President’s picture would be used to update the company image. I had suggested to them that they use a picture of all the officers. They felt strongly that this would make the brochure look like a family album rather than a corporate presentation piece. I accepted their judgment and hope in doing so I don’t have any wounds. Personal aggrandizement was not the objective. But if there were any hurt feelings, the Schmid brothers worked it out. The following year (April, 1969) Business & Industry did an article about Crescent Electric during its 50th Year Celebration. No surprise, this time around all four Schmid boys were featured on the cover! The link to the entire article is included here if you are interested in reading it. Iowa Business & Industry (April, 1969). Read the full article here. 1971 newspaper article in the Telegraph Herald. Tom’s commitment to giving back extended to his profession by serving as President of the National Association of Electrical Distributors (NAED). Electrical Wholesale Magazine (February, 1972). Read the full article here. 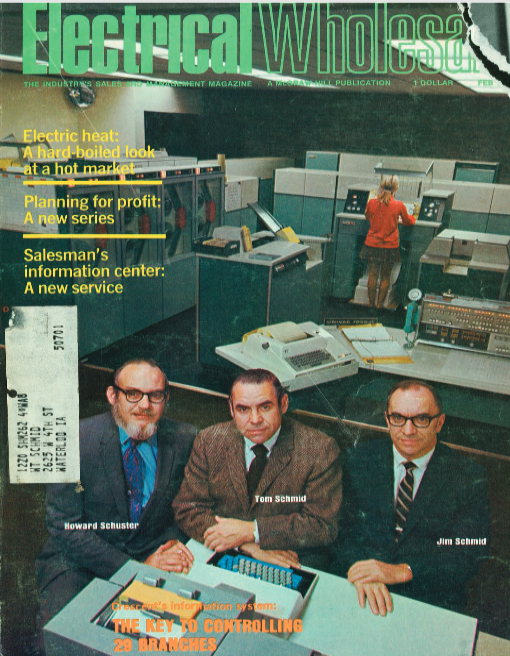 In February of 1972, Electrical Wholesale Magazine ran another cover story on Crescent Electric showing Tom and his brother Jim, along with Howard Schuster, on the cover. If you are interested in reading this article, click here for the link. Not surprisingly, Titus was actively engaged in the business throughout his life. While he had confidence in his sons, he did not want them to lose sight of the many challenges he faced, and his sons would continue to face, in keeping the business growing and profitable. Tom was a great leader in the business and the family. During his fifteen years as President of Crescent Electric Supply Company he built a culture of transparency and hard work that he exhibited every day in his work with employees, vendors, customers and his own family. Sadly, Tom Schmid died of cancer in July of 1974, leaving the Schmid family to carry on without their beloved son, brother, husband, father and uncle. At the September 1974 Board meeting Titus announced the election of officers. His son, Jim, became the next President of Crescent Electric Supply Company. In the next vignette we will talk about Jim’s role in successfully leading the company for the next 26 years. 1974 Board Meeting officer announcement.